Whats that big mound in your yard with the pipe sticking out of it? Often that was the first question people asked as they arrived at my house in a semi-rural town on the mid-coast of Maine. Its the leach field for my septic system, Id say. Sometimes that was enough of an explanation. I had roughly the same level of knowledgeor should I say ignoranceabout septic systems when I bought the house. A quarter of U.S. residents use septic systems instead of sewers, but I was a newbie. I grasped the basic concept that water I flushed down the toilet or drained from the sink, shower and washing machine would go into the septic system. Then a series of pipes buried in the big mound, or leach field, would release it into the soil, where microorganisms would clean up the water. The pipe sticking out of the mound provided ventilation to help the whole system to work as it should. Beyond that, I didnt have much of a clue. It turns out theres more to it than I ever would have guessed. I grew up in a town in suburban Massachusetts where everybodys house was hooked up to the towns sewer system. The moment we flushed the toilet or drained the sink, the water and its load of dirt, soap, human waste and food scraps became somebody elses problem. That was true everywhere Id lived as an adult, too. Not the case at my new home. I became responsible for making sure the bad stuff in my wastewater would not seep into groundwaterand eventually into the ocean inlet by my house. Naïvely, I figured that since my septic system complied with local regulations and was well maintained, my wastewater and I were not a source of pollution. I actually really liked having a septic system for the same reason I liked getting water from my well instead of a town water supply, and burning wood instead of oil to keep warm. It made me feel self-sufficient and connected to the land, unlike when Ive lived in suburban or urban homes. To me, a septic system seemed more environmentally friendly than a town sewer system. 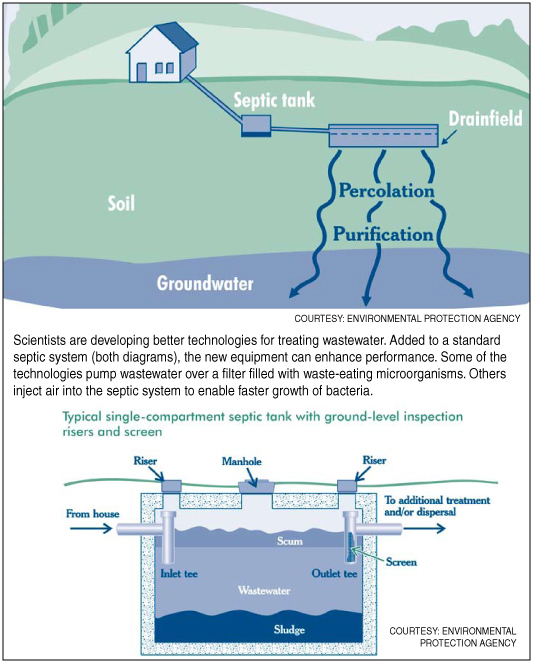 I didnt know that even a legally designed, well-maintained septic system is scarcely better than a sieve for dealing with some pollutants. Nitrogen is the worst offender. Eighty percent or more of nitrogen typically escapes untreated through a conventional septic system. That can add up to 10 pounds (4.5 kilograms) of nitrogen per year for each person using the system. Once the nitrogen gets into a lake or bay, it fuels out-of-control growth of algae, which can foul the water body and compete for nutrients. The problem is that conventional septic systems lack oxygen. The persistent scarcity of oxygen prevents the combination of nitrogen and oxygen atoms into nitrate molecules, which then can change into nitrogen gas. In its gaseous form, nitrogen is harmless and does not fuel growth of algae. It really surprised me thateven in peak operating conditionmy trusty septic system might have contributed to pollution in the ocean that I enjoyed seeing from my sofa. Most people remotely familiar with septic systems know that an inadequate or broken system causes pollution, but the serious shortcomings of good septic systems arent as widely known among homeowners and other regular folk. Consequently, I was glad to discover recently that scientists and engineers are conducting research to overcome the technical shortcomings of conventional septic systems. Already, there are many options available, such as fixed media (in which the liquid is pumped over a filter filled with waste-eating microorganisms, allowing fast treatment in a relatively small space) and suspended-growth systems (in which a blower injects air into the system to increase the dissolved oxygen and enable faster growth of bacteria). The main drawback is that the new technologies tend to cost far more than a conventional system. An approach called periodic aeration might emerge as a cheaper but effective solution. José Amador of the University of Rhode Island and David Potts of Geomatrix LLC are testing the approach using a simple, low-cost device that blows air into the septic system at regular intervals. By injecting oxygen, the device allows the formation of nitrate. Funded in part by the Cooperative Institute for Coastal and Estuarine Environmental Technology, the laboratory experiments and field trials show that periodic aeration can enable a conventional system to remove up to 75 percent of the nitrogen in wastewater. Thats a dramatic improvement. Peter H. Taylor (peter@waterviewconsulting.com) is a consultant for the Gulf of Maine Science Translation Project. He specializes in communication of coastal and marine science.